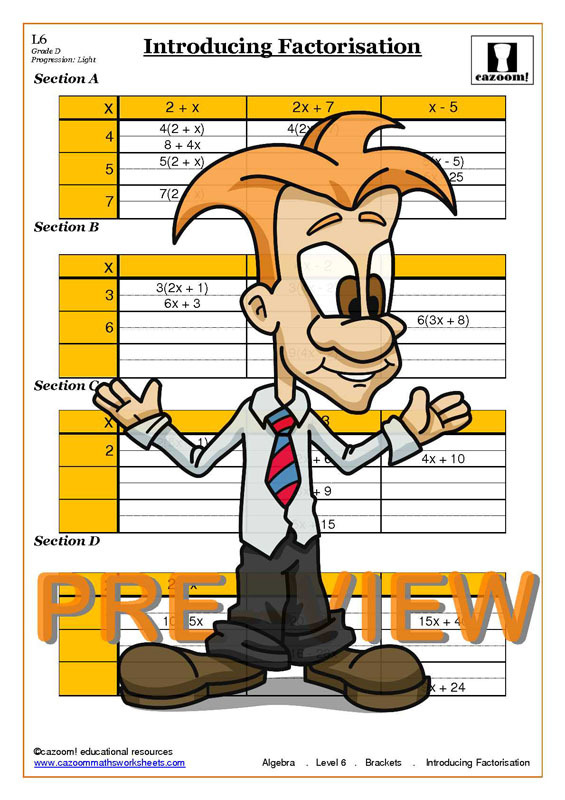 Our factorising worksheets are designed to help students conquer all types of equations. From expanding the brackets to factorising quadratics, our factorising expressions worksheets are all clearly presented and easy to follow. 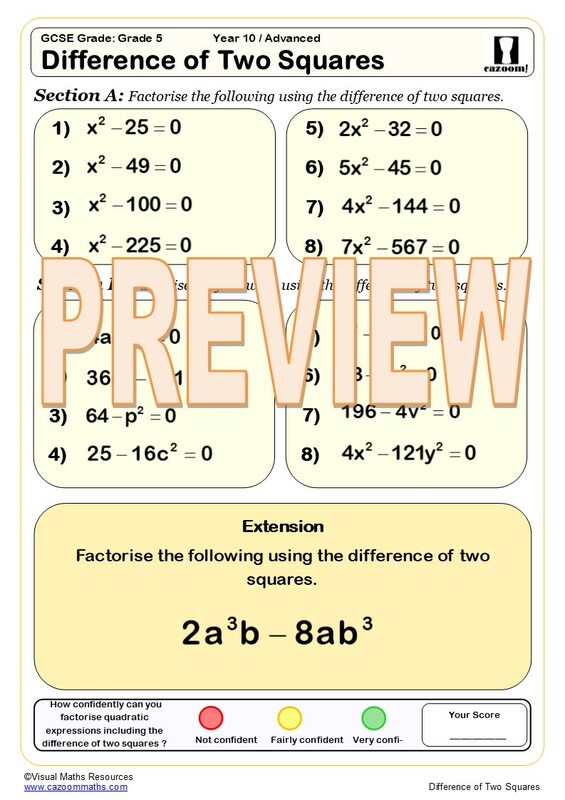 We have factor maths worksheets suitable for all abilities, and they are all supplied with answers to assess how well your child or pupil is doing, and highlight areas for revision. We have a wealth of resources to improve students’ confidence answering all types of expanding and factorising maths questions. 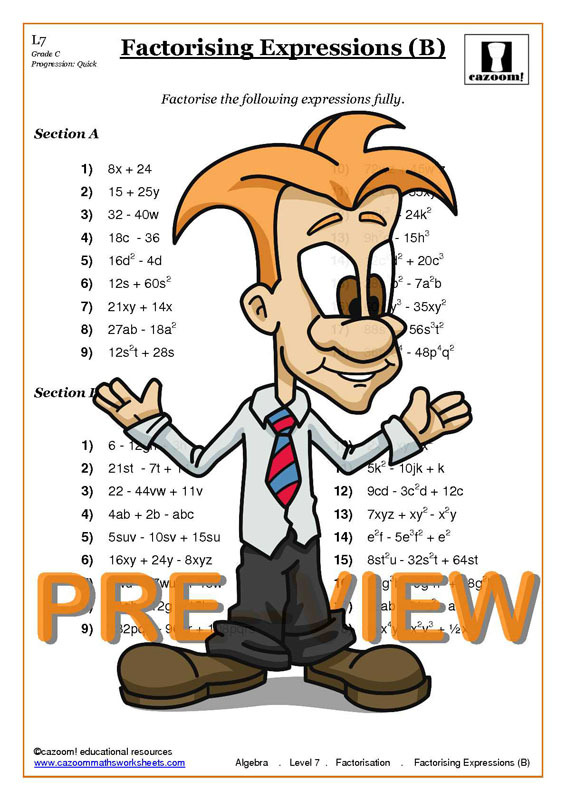 Algebra is unavoidable at school so make it enjoyable by using our factorising quadratics worksheets! 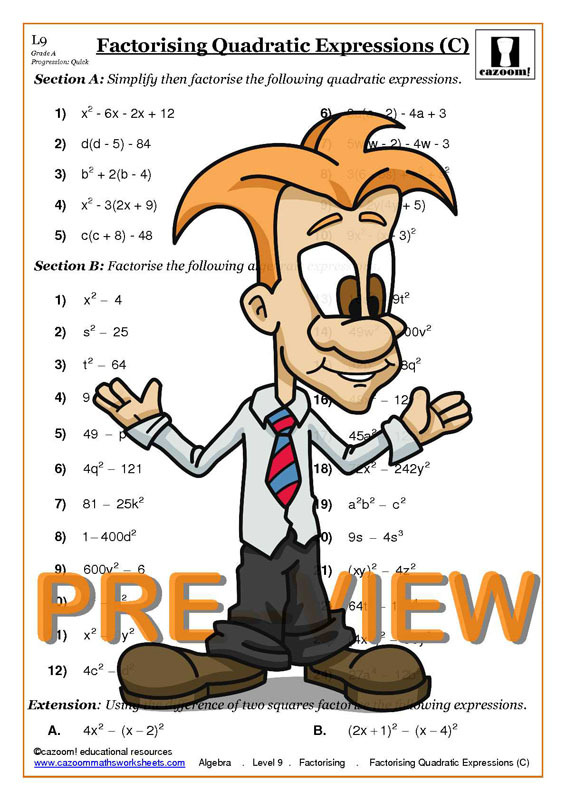 Use our factorising quadratics worksheets to help your child or pupil navigate the occasionally complicated world of expanding and factorising. 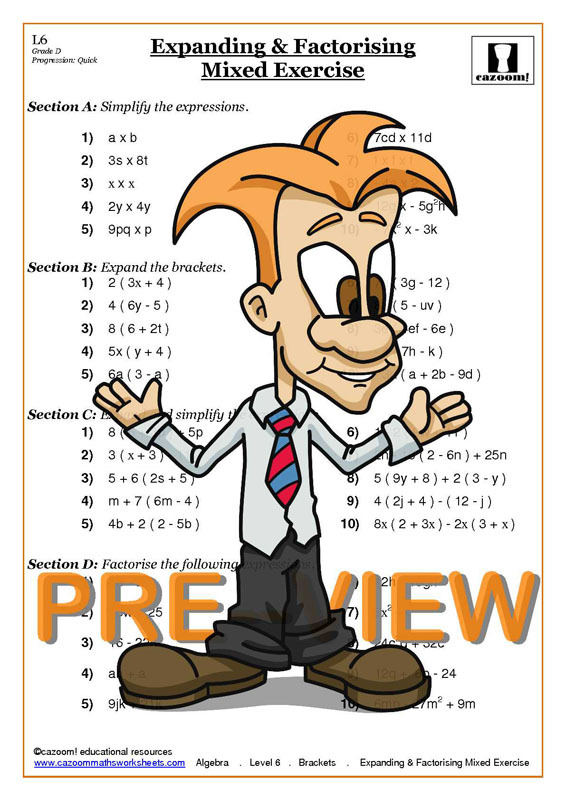 At Cazoom Maths, our worksheets cover all factorising expressions problems students will come across during their time at school, and present this important information in a clear and engaging way. 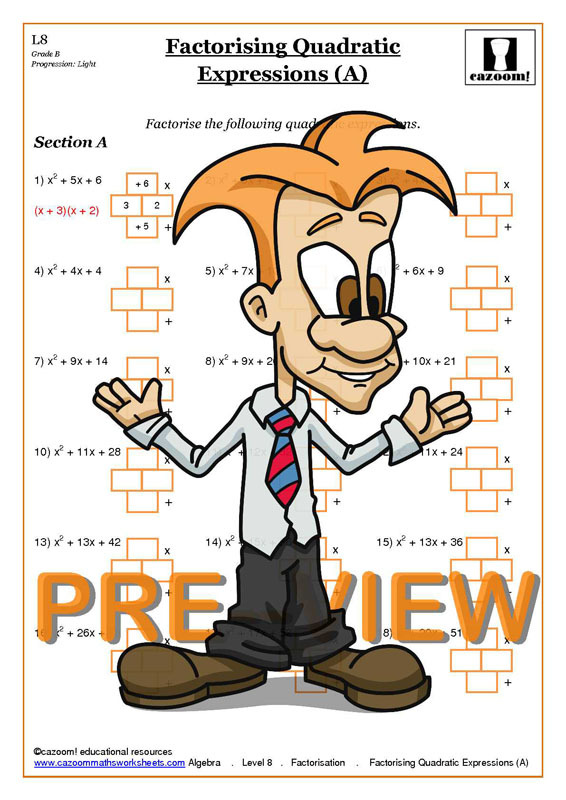 Take the fear out of factorising with our factorising equations worksheets! Factorising is a method for solving equations which is useful for GCSE students, more advanced students, and even professionals. Factorising, as with many areas of algebra, can cause many students headaches. Learning how to expand brackets and factorise quadratics is an essential skill, and although students might complain that they will never need this information, what they don’t realise is that factorising is very important. 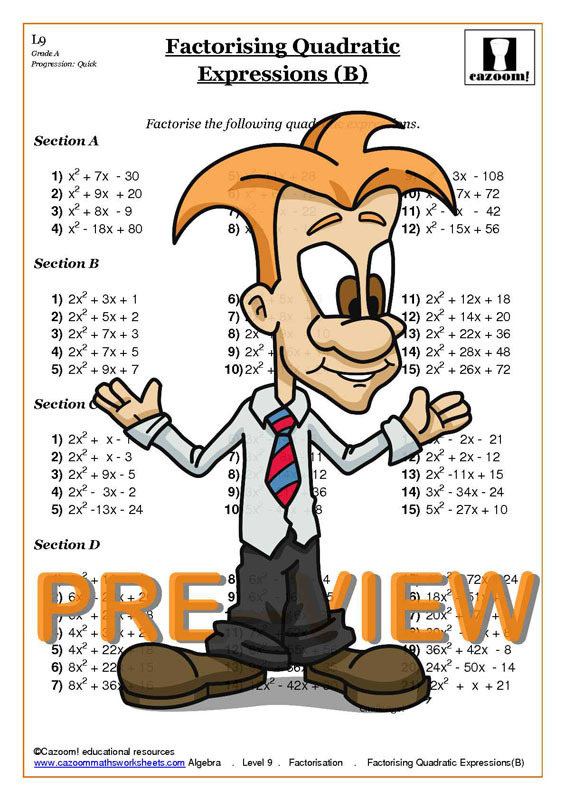 Learning how to factorise expressions will help prepare students for their GCSE maths exams. If students wish to study sciences after their GCSEs, they will need to know how to factorise. Using clearly presented maths worksheets will help familiarise students with the types of questions they will come across and enable them to feel confident when approaching factorising in GCSE maths or in their further studies. Those who work in the science or technology industries will use their algebra knowledge and factorising skills every day. Within these industries, there are computer applications which solve equations and simplify expressions, but computer issues can occur, and in these cases staff will have to rely on the knowledge they learned in school. Students might not realise just how important factorising might be for them, so use engaging factorising worksheets to help them gain confidence using this method.